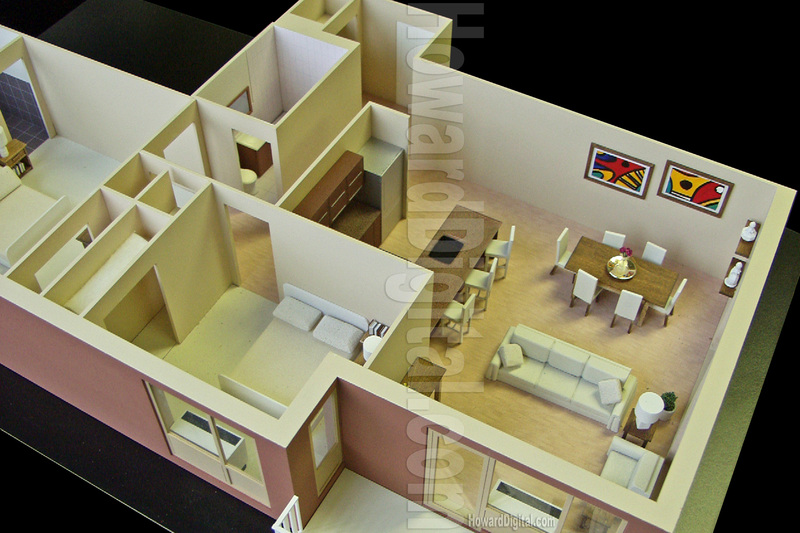 We are committed to being your architectural interior model builder of choice. Therefore, we have redesigned the architectural model building process with your needs in mind. Our new process speeds production communications, and adds flexibility to the construction process. You can expect extraordinary architectural models within your deadline, architectural models that reflect your design changes without change orders. Our new 3D to Laser process compresses our production time, while it increases your design development time. As skilled architectural model builders, we use the most effective technologies available: 3D CAD modeling, laser cut parts, stereo lithography, machine milled topographic modeling, and high density resin casting. We have brought these assets together under creative management to produce the most efficient architectural model building process available today. Throughout each architectural model, we will give you the information you require to have a high level of confidence in the final product. Our Dynamic Project Review web site permits you to review your in-progress architectural model on-line. While you're always welcome at Howard Architectural Models, the fact that fewer than five percent of our clients visit our facility is evidence of our success in communication. Your architectural models can be completed in 4-6 weeks or less. Call or Email for more information.